When it comes to events, there is not a category of entertainment that has a more dedicated fan base than sports. Atlanta offers a particularly robust variety of teams. With Atlanta United FC dominating in soccer, the Falcons just beginning their season, and the Braves at the top of their division, it is hard to think of Atlanta as less than a powerhouse sporting city. Yet flying relatively under the radar is a team that played in its league’s conference semifinals at McCamish Pavilion: the WNBA’s Atlanta Dream. Founded in 2008, the Dream, owned by two female business partners, has managed to become a strong presence in the league without an NBA pairing. The ability for the stand-alone expansion team to self-sustain proves the strength of the team as a whole. However, the first season was far from perfect. The Dream set a record for most consecutive losses in the league at 18 and finished the year at the bottom of their conference, with a miserable 4-30 mark. Dreading this repeat, coach Marynell Meadors acquired veterans in free agency to bolster her young squad with experience. Perhaps most importantly, the team drafted guard-forward Angel McCoughtry from Louisville with the first overall pick in the draft. Until her season-ending knee injury suffered this August, McCoughtry was consistently the Dream’s centerpiece. 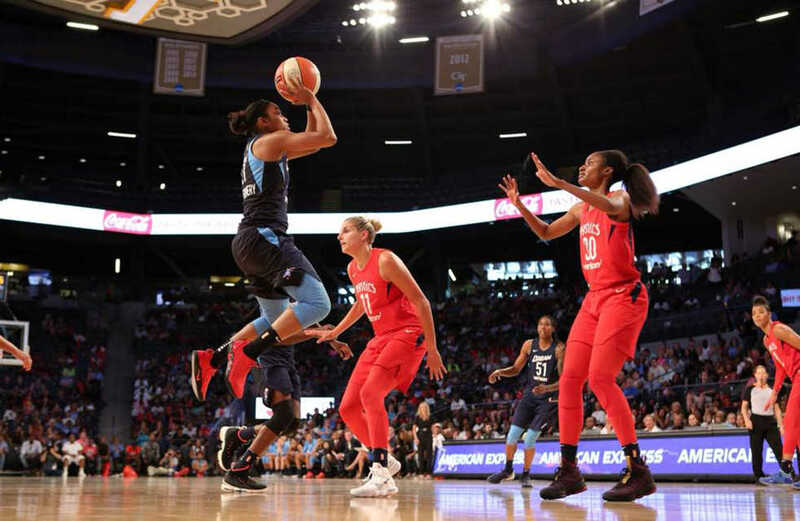 Coming with a vengeance, Atlanta Dream was looking to make it back into the WNBA finals as they played Game Five against the Washington Mystics. The Seattle Storm yet again found their way into the other semifinal matchup; if both Atlanta and Seattle advanced, it would be a rematch of the 2010 finals in which the Mystics edged the Dream. The Dream came into the series a drastically different team than the one that struggled to string a pair of wins together the year before. They averaged 81.8 points per game, which is above the league median by almost two points. The dominance continued on defense, where the team averaged an impressive 7.6 steals per contest. Winning 23 of their 34 games, the Dream found themselves at the top of the Eastern Conference and played for a championship berth for the second time in three years. Star player of the Mystics, the towering Elene Delle Donne, faced a knee injury in game two of the semifinals. Although returning to the court for a few minutes of playing time, adorned by a large knee brace, she was not able to find the back of the net. But with the series tied, Delle Donne put up 14 points in a gutty winner-take-all Game Five performance, giving her team an advantage at the end and leaving the Dream and their fans wondering what might have been. This shortcoming should not at all diminish the Dream’s accomplishment; the team was six points in Game Five away from advancing to the Finals for what would have been the fourth time in nine years, and if not for the injury to McCoughtry, they could have gone even further. And win or lose, the team played its best basketball right on Tech’s campus. Players will come and go, sponsorships will change and coaches will retire, but the Dream will remain a fixture in Atlanta.